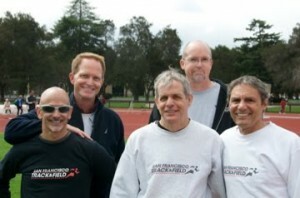 Big congratulations to Allen Eggman, Bob Callori, Chris Goodwin, Chuck Louden, Marcus Valera, and Rick Thoman who competed in the Bay Area Senior Games at Stanford University on a not-so-warm March Sunday. Good performance by all, despite the fact it is still early in the season. Great job, guys! Below is today’s results. Allen Eggman Pole Vault 3.05m 3rd. Qualifier for National Senior Games. 100m 13.61 2nd. Qualifier for National Senior Games. Long Jump 4.98m 1st. Qualifier for National Senior Games. Chris Goodwin 100m 14.65 4th. Qualifier for National Senior Games. 200m 31.46 4th. Qualifier for National Senior Games. 400m 1:07.13 4th. Qualifier for National Senior Games. SFT&FC 4 x 100m Relay 1:11.47 1st. Bob, Chris, Marcus +1.